My mom, my son and I went outside today and looked for signs of Spring together. We found flowers blooming, buds and leaves on trees, new plants rising out of the soil, and a nest of baby spiders. My son was very interested in all these signs of spring and followed us all over my mother’s property while we searched for more signs of Spring. My son has the advantage that he has a grandmother with a house on a small island nestled in a forest and with a nice garden. As I walked around the garden, I felt very fortunate to have the ability to explore nature with my son. In our home in Vancouver, there are signs that Spring is here, but they are harder to find amid the concrete jungle. I can’t imagine what it would be like if your home was less "green" than Vancouver. I rememembered, for example, that in New York City that there were a lot fewer green spaces than in Vancouver. What do we do for children who do not live in places where the coming of Spring (or even the change of seasons in nature) is obvious? How can we ensure that all children get to experience nature? 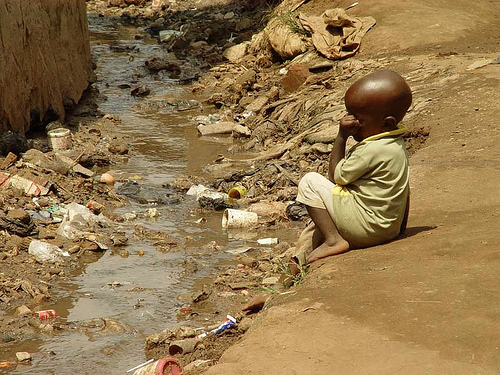 More importantly, what do we do for children who live in places like this? I know that our world is not fair, but it worries me that it is becoming less fair in many ways rather than more fair. I worry that the vision I would like to see for our future, where we all live in a sustainable world, is much different than what some of our leaders envision. When I see our own social services eroding, and less concern for the living conditions of people abroad from our local governments, it makes me worry, and wonder what I can do to work toward a brighter future.